"We must be: Decent– Reliable – Flexible"
We must develop and transform ideas and solutions to benefit our customers and partners. "Everything we do, must create value to our customers and partners." "Doing business with us has to be easy"
"Our employees are our most important resource - and ambassadors"
The 28th of October 2014, the Danish Minister of Defence Nicolai Wammen visited Brdr. 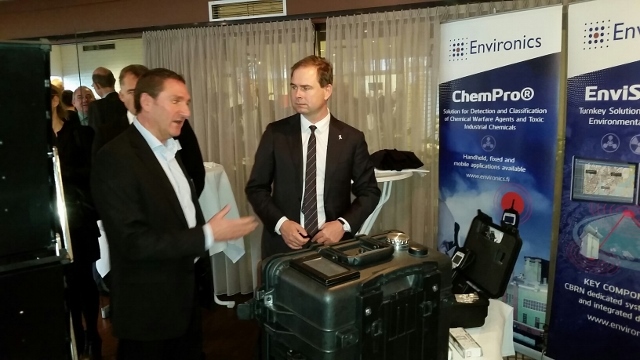 Jørgensen Instruments’ stand at the first Danish Homeland Security Conference in Billund regarding Environic’s CBRN(Chemical, Biological, Radiation and Nuclear) detection equipment and Early Warning systems. The Environic’s CBRN detection equipment, provided by Brdr. Jørgensen Instruments, is currently in service in the Danish Defence, and along with chemical detectors CWA and TIC. We are one of "the Secret Heroes"